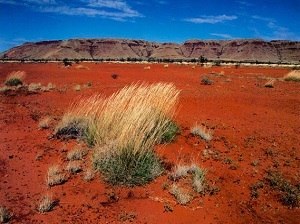 The Ernest Giles project is located 250km north-east of Laverton in the Yilgarn in central Western Australia. 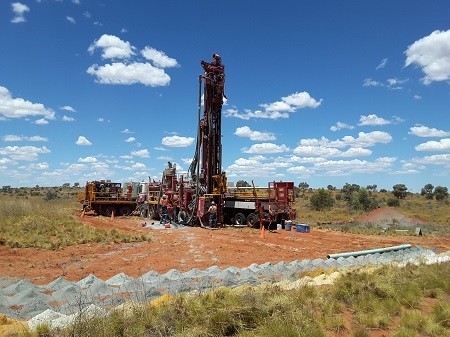 The project covers over 2,000sq km of unexplored Yilgarn Craton hosting greenstone belts and intrusives with over 210km of strike of prospective rocks. Greatland believes the project has the potential to deliver significant shareholder value with the discovery of large +5 mil oz gold deposits. The eastern Yilgarn Craton is the most highly mineralised area in Western Australia, containing numerous gold deposits e.g. 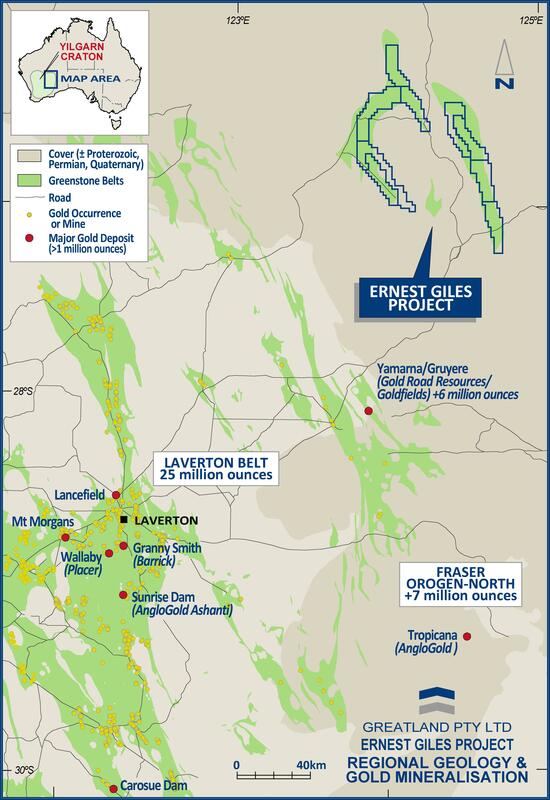 Laverton +25mil oz, Tropicana +5mil oz, Yamarna +6mil oz, all of which are found in greenstone belts of similar size to that in the Ernest Giles area. Due to its remote nature and cover sequences there has been only limited previous exploration in the Ernest Giles area. CRA Exploration and WMC Exploration explored parts of the project area between 1996 and 1999. 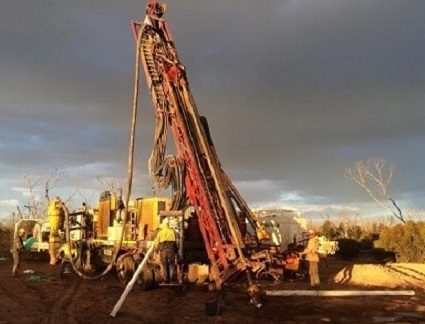 Limited reverse circulation (RC) drill holes were completed by WMC Exploration which confirmed the presence of gold prospective Archean rocks at a depth of 170m. Greatland Gold results so far are very encouraging considering the unexplored nature of the property. Interpretation of aeromagnetics has outlined numerous gold prospective targets under recent desert sand and sediments. These targets are at various stages of exploration. Surface sampling has returned very high results with up to 338ppb Au in soil, in target areas which are yet to be drilled. 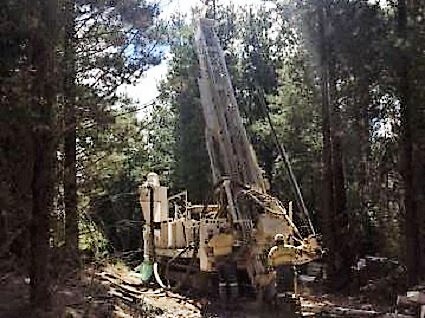 Over 12,000m of RC and 1,500m of diamond drilling by Greatland in other targeted areas revealed large alteration systems and gold mineralisation over 1g/t. The 2016 RC drill programme comprised 23 holes for 5,581m. Hole locations were based on a broad spaced grid pattern of 1,600m x 800m. Holes were designed to test basement lithologies for gold mineralisation and also test beneath surface geochemical anomalies. Mineralisation was observed in 13 of the 23 holes. Initial 4m composite analysis of drill spoils shows gold anomalism between 5 and 95ppb in more than 10 holes peaking at 784ppb. Several holes exhibiting gold anomalous zones over tens of metres, for example ERC011 140-200m (60m) peaking at 0.78g/t gold with mineralisation at end of hole, and ERC014 224-278m (54m) peaking at 0.17g/t gold also with mineralisation at end of hole. 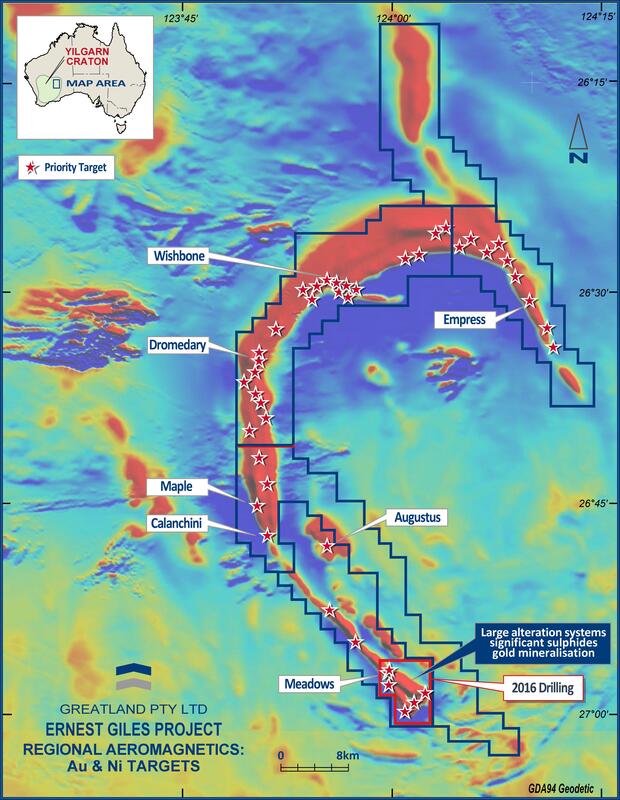 Results of drilling outline two, large, north-west trending zones of mineralisation. The Western Zone being 6km long and 1.5km wide and open to the north, and the Eastern Zone 2km long and 1.5km wide which remains open to the north and south. The cover sequence was not as thick as expected with shallowest intercept of 119m, but generally around 180m depending on location. Varying basement lithologies were intersected including basalt, band iron formation and syenite. Silica and biotite alteration were prevalent with quartz veining and sulphide mineralisation. Additional 1m sampling of several zones of interest was undertaken to confirm preliminary results and better define mineralisation. Only holes ERC011, ERC013 and ERC014 were sampled with a total of 174 single metre samples collected. Many significant gold results were returned up to 2g/t, including 2m at 1.51g/t and 1m at 1.54g/t. Anomalous silver was also noted in many samples. Results confirm mineralisation is present over a large area and suggest that Greatland has discovered a new gold province in this largely unexplored region. Under an agreement with the Company, Newmont Exploration Pty Ltd carried out a Deep Sensing Geochemistry (‘DSG’) survey at the Ernest Giles project during 2017. 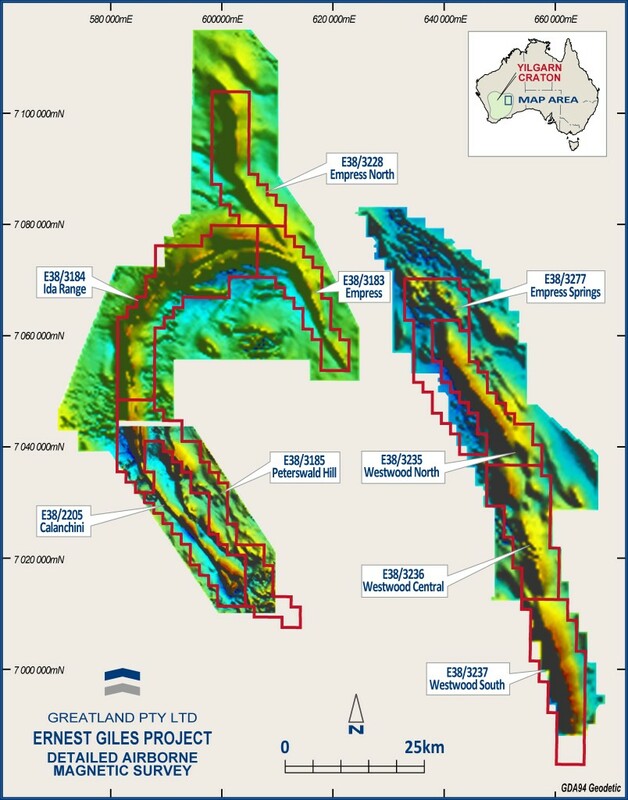 DSG sampling was completed at the Meadows area and results successfully defined several gold anomalies, the most significant of which is approximately 5km long and 1.5 km wide in the vicinity of previous Greatland drilling which had intersected gold mineralisation in Archean basement rocks under 100-200m of cover. The anomaly is apparently perpendicular to the regional geological strike suggesting a strong structural control on mineralisation. DSG results were also successful in identifying overall basement lithological trends and recognised a belt parallel alteration signature commonly associated with large scale mineralised systems. A new programme of MMI sampling was completed at Ernest Giles in 2018. Over 980 samples were collected at a spacing of 800m x 200m over the Meadows, Empress and Wishbone targets. At Meadows an area of approximately 10km x 8km was sampled, with gold results subtle but broadly outlining and reflecting results of DSG by Newmont. Elevated MMI responses (peaking at 0.6ppb gold) were also returned from outside of the area covered by DSG, particularly along strike to the north-west over an area of approximately 4km x 1km, potentially outlining a new western target subparrallel to those defined by previous RC drilling. This new western target lies some 5km north-west of previous drilling and the large DSG anomaly previously identified by Newmont. At Empress MMI sampling covered approximately 12km x 4km. Results outlined several clusters of elevated gold responses over a strike of approximately 9km (peaking at 0.5ppb gold). The overall trend of the elevated gold response matches that of bedrock geology as defined by detailed aeromagnetic data. At Wishbone MMI sampling was completed over an area of approximately 4km x 3km and extended coverage over the target to about 30 square kilometres. Elevated MMI gold response (to 0.4ppb gold) is apparent across the target, particularly in the north-west and central eastern parts. The Company conducted a Reverse Circulation drilling programme at the Meadows, Empress and Wishbone areas in mid-2018. The drill programme at Meadows consisted of twenty-five holes testing the 5km x 1.5km anomaly defined by DSG work which remained untested by previous Greatland drilling and over a total area of approximately 7km by 6km for a total of 6,710m of drilling. RC holes were drilled on an 800m x 800m grid to depths of around 300m to 350m each. In addition, RC holes were also completed at Wishbone and Empress to test basement geology and physical rock properties. Results confirmed and reinforced those from previous drill campaigns at Meadows with many holes displaying obvious signs of mineralisation including disseminated sulphides, quartz veining, and alteration including chlorite and epidote. Broad zones of consistently anomalous gold (above 2ppb) were apparent in many holes for up to 40m metres and these are considered significant in a regional sense. Highest individual result was 4m at 0.2g/t gold from 232m (ERC061). This latest result extends mineralisation at Meadows further north of that previously identified, and the location of drill holes returning an elevated gold response in bedrock generally coincides well with the broader surface geochemical response. Based on results returned to date two main zones of bedrock mineralisation have been outlined at Meadows. A Western Zone which has been extended to a strike of approximately 6.2km and open to the north, and an Eastern Zone with a strike of approximately 2.5km. 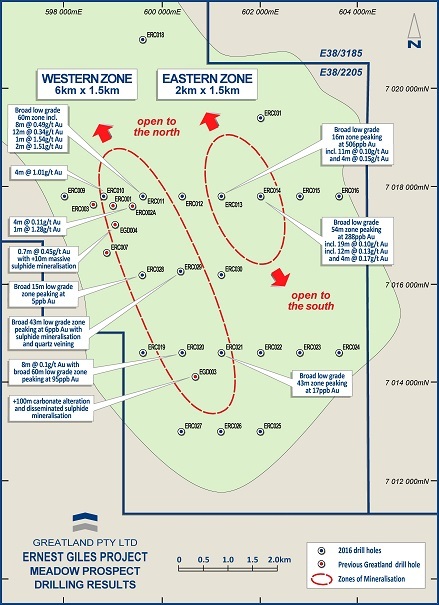 Recent acquisition of a large, detailed airborne survey has highlighted several new structural targets suitable for gold mineralisation. The Ernest Giles project area clearly shows similarities of size, structure, and magnetic signatures to the Mt Magnet area which has yielded in excess of 5 million ounces of gold. 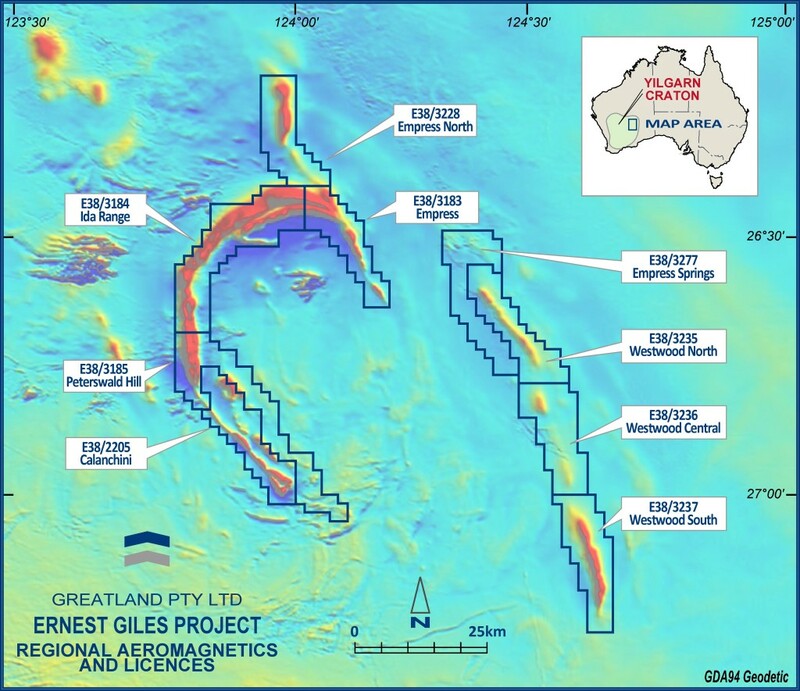 One objective of our planned exploration will be to better understand the geology at Ernest Giles which the Company believes is very similar to Mt Magnet. 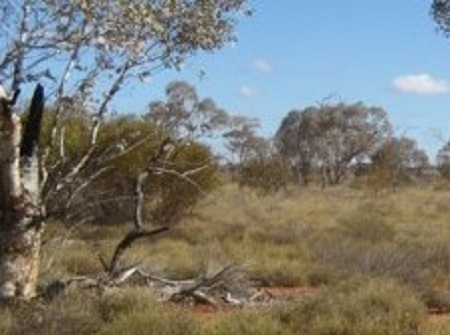 The project area covers two buried Archean greenstone belts, part of the Yilgarn Craton. The Archean basement is recognised to be part of the far eastern Yilgarn Craton. The eastern Yilgarn region contains the Wiluna, Leonora, Kalgoorlie, St Ives, and Norseman gold camps and the ‘world-class’ nickel sulphide deposits of Mt Keith, Leinster, and Kambalda. At Ernest Giles, the locations of the Archean greenstone belts have been interpreted from aeromagnetic data collected by the Australian government and Western Mining Corporation (WMC). These aeromagnetic images clearly show the presence of linear, strongly magnetic lithologies within the project tenements. The Archean greenstone sequence is covered by approximately 10m of recent desert sands along with +50m of fine grained Proterozoic sediments. Modern geophysics and geochemistry allows us to ‘see’ through the cover sequences to define drill targets. Similar Archean stratigraphy is seen at Mt Magnet, 600km to the west. Gold deposits at Mt Magnet have yielded in excess of 5 million ounces of gold. 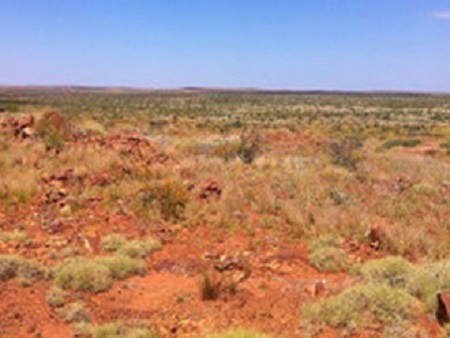 The Tropicana gold resource, 250km south of Ernest Giles, currently stands at over 5 million ounces of gold and this discovery has been made beneath desert sands in the order of 20 to 40 metres thick.